The Parc de Bercy is one of the parks in Paris that was only opened in 1990s after the Bercy area was redeveloped, yet it still retains its history, even though it has a contemporary layout, but there are many places to visit around here including museums, shops, restaurants and a stadium. 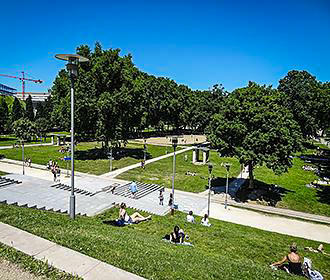 Located along the River Seine, the Parc de Bercy is situated between the Palais Omnisports de Paris-Bercy stadium, or POPB for short and the Cour Saint Emilion and is a very contemporary styled park in Paris. Yet it still retains old features such as cobbled streets and the train tracks that relate to the history of Bercy, which was at one time the largest wine market in the world. And spread over an area of 14 hectares, this is one of the important parks in Paris that has something for everyone of any age, either in the park or at the edges of it, just like the Bercy Village with its shops, boutiques and restaurants like the Chai 33 with its wine cellars, or the Pavillons de Bercy, which are the restored wine warehouses that now hold the Musee des Arts Forains fairground museum. There is also the Cinematheque Francaise, which is the multi-screen cinema and this is also home to another museum in Paris, which is the most impressive museum in the world dedicated to cinema called Le Musee de la Cinemateque. However, you can also discover the sculptures by Rachid Khimoune called the Children of the World, that were created in 2001 to honour childrens rights throughout the world, plus there is a childrens playground, a skate park with slopes and jumps made of metal and a man-made pond with a canyon called the Canyoneaustrate that was created by Gerard Singer. You can also discover a labyrinth made of yew hedges, a vineyard that is cultivated every year, and the Pavillon du Vent, which is the House of Wind that consists of tall columns formed in a circle that has a weather vane and other measuring instruments in the middle for measuring the direction and velocity of the wind. In addition to this, there are many different footbridges, along with a wide stairway that leads to a terrace, yet down the middle of this stairway is a cascading fountain designed with channels of water that flow down, plus there is a carrousel that operates every day. Also, there are many walking trails and plenty of places to sit including covered seating areas, or those that almost seem to be hidden because of the small hills and valleys that have been created, not forgetting the vast expanse of lawns for relaxation or picnics and the gardens. 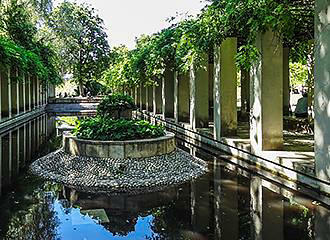 The Parc de Bercy is made up of three different gardens that were designed by the architects Bernard Huet, Madeleine Ferrand, Jean-Pierre Feugas and Bernard Leroy along with the landscape architects Ian Le Caisne and Philippe Raguin. The first garden is called the Grande Pairie, which basically translates to the Great Meadow and is a vast area that is mainly laid to lawn, with shade from old trees, some of which are coming up to around 200 years old and this is an ideal area for games or relaxation. It is here that you can discover the Canyoneaustrate, which is the sculpted canyon water fountain. On the terrace you will find lime trees that have been planted along with the sculptures of Children of the World, and a pedestrian arched bridge walkway called the Passerelle Simone de Beauvoir footbridge, which is one of the newest bridges in Paris that leads to the Bibliotheque Nationale de France library over the River Seine. And on one side is the modern building that was designed by Frank Gehry to house the American Cultural Centre that became the Cinematheque Francais and the Musee de la Cinematique Museum of Cinema. Now in front of this building is the Jardin Yitzhak Rabin, which when it was inaugurated was named after the Prime Minister of Israel who had received the Nobel Peace Prize in 1994, yet was assassinated in 1995. 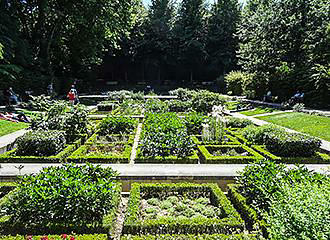 The second garden area within Parc de Bercy is known as Les Parterres is actually made up of different gardens, such as the Jardin des Senteurs, which is the scented garden, la Roseraie, which is the rose garden that contains no less than 90 different varieties of roses, the kitchen garden known as the Potager and the Jardin des Bulbes bulb garden along with a vegetable garden that is maintained by school children in Paris and an orchard. And it is also within this area that you can discover the Pavillon du Vent and the labyrinth along with the 400 vines in the vineyard that was designed to remember the history of Bercy, plus a series of trellises that are covered with vines in addition to the Maison du Jardinage. 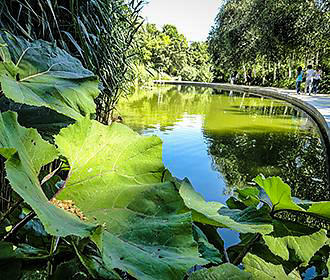 The third area within the Parc de Bercy is the called the Jardin Romantique or Romantic Garden and there are two footbridges that span the Rue Joseph Kessel to give you access to this refreshing landscape with its ponds. 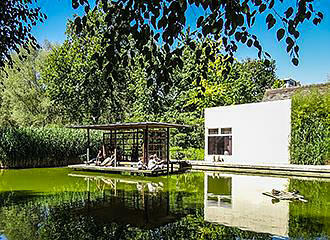 Having lovely winding and meandering paths that take you through the romantic gardens with its oak, sweetgum and willow trees, there is a lake that is frequented by ducks and an island in the middle with the Maison du Lac or Lake House located on it that holds temporary exhibitions. You can also discover ponds with water lilies and fish, and one has an unusual sculpture called the Demeure X that was produced by Etienne Martin and it was these series of sculptures that made this artist famous. Yet it is from this garden that you get to the Bercy Village, but do not forget that there is also the Pavillons de Bercy, which are the old wine warehouses that have been fully restored. And located by two original cobble streets that have century old chestnut and plane trees along with the original train tracks that used to bring the wine and spirit barrels from the River Seine to the warehouses, this now holds the Musee des Arts Forains, fairground museum in Paris, plus the Bercy Pavilions also hold private functions and corporate events. 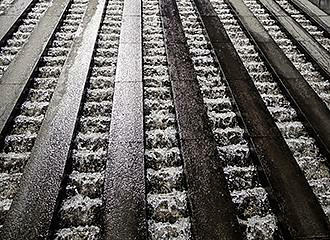 This park in Paris has become one of the most successful urban development projects of recent years and is now home to the Ministere de l'Economie et des Finances Finance Ministry, which is connected to the River Seine for VIP transport. There are public toilets located in different areas such as between the Saint-Vivant entrance to the Cour Saint-Emilion and the Rue des Pirogues de Bercy, and although some parts of the Parc de Bercy are accessible to the disabled, others are not, like the cascade fountain, a footbridge that has steps, etc. Travelling here on the public transport in Paris you can utilise the Metro stop called Bercy or the Cour Saint-Emilion stop on the Meteor line 14, which is one of the fastest Metros in the world, plus the buses numbered 24 and 87 will also get you to this park and its gardens in Paris.